Replacing a Strut: Loaded or Bare? A loaded strut is a complete, bolt-on replacement that can be easily installed at home to restore handling to factory settings. A bare strut reuses the original coil spring so it’s cheaper but will require tool rentals or shop time and usually additional replacement parts. Strut replacement is generally recommended between 50-100k miles and can vary based on the conditions of miles being traveled. Coil springs usually last longer but can succumb to corrosion and rust if the protective coating is compromised. Deciding how to replace your strut is based on several factors such as cost, condition of other parts, and whether or not you want to tackle the project yourself. In a MacPherson strut assembly the strut is basically an oversized shock absorber that runs down the middle of the coil spring and connects to the frame-to-strut mount and steering knuckle and aids the spring in damping vibrations. 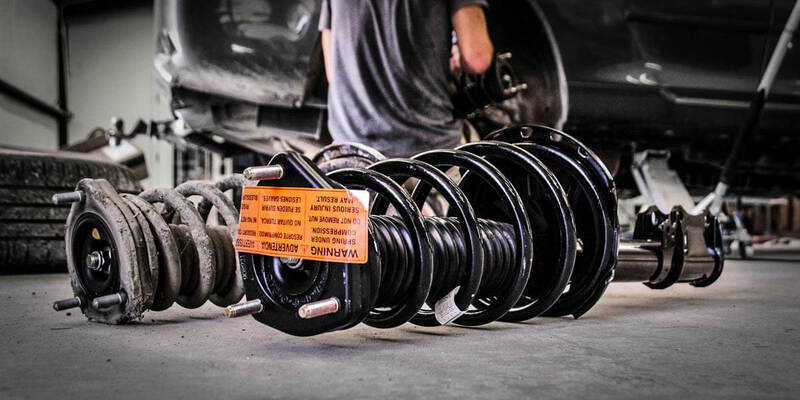 A loaded strut, or complete strut assembly, is the entire MacPherson strut replacement unit that includes the coil spring, isolator pads, jounce bumper, top strut mount and bearing, and the strut itself. These can all be signs that your struts or springs are beginning to wear out and needing replacement. When deciding between a bare strut replacement or a complete strut assembly (loaded strut, quick strut) there are a few issues you should consider. Sometimes your only alternative may be the OE struts. Some year/make/models just aren’t covered by aftermarket manufacturers so the dealership or the junkyard might be your only options. Bare strut replacements don’t include a new spring or other parts so they are cheaper and easier to manufacture than a strut assembly. Because of this they are easier to find for many vehicles and range from OE replacements to performance upgrades. Complete strut assemblies can be difficult to find since aftermarket parts manufacturers generally cover more popular makes and models. Shops and DIYers are beginning to see the time-saving and complete replacement features of a loaded strut as very beneficial so coverage is expanding. The condition of the coil springs is a big factor when deciding how to replace your strut. You can assess the condition of the springs by looking up the ride height specs of your vehicle and if it has changed considerably then the springs are more than likely the cause. Inspect the spring for irregularities or cracks and if ride height is up to spec then the original spring is probably safe to reuse on a new strut. Sagging springs should be replaced since they can allow your vehicle to bottom out more easily and put increased stress on the strut and can affect wheel alignment and steering. In these instances the strut assembly is an easier solution since it replaces the spring and strut in one application. The other components that make up the strut could also be worn and need replacing. One part that is always recommended to be replaced is the top strut mount. This mount and bearing allows the strut to pivot with steering input and can become worn over miles and time. If the bearing binds up then the rod can be forced to rotate inside the piston, causing undue wear. The jounce bumper and other rubber isolator pads will also wear down eventually and need replacement. So with a bare strut most of these parts are reused but they have their best years behind them. A complete strut replacement will reset the clock on further component replacements. The loaded strut is a simple bolt-on installation that can be done in the average garage and only requires wrenches and maybe a socket set. To replace only the strut is a more difficult project that will require renting spring compressors or having the job done professionally. Compressing a coil spring is not a project to be taken lightly and a botched job could hurt, damage, and provide the ground work for a legendary story later. * It is universally advised to replace struts in front or rear sets. Replacing a strut on only one side will almost certainly cause problems with vehicle handling. Depending on brand and quality a bare strut is almost always going to be cheaper than a complete assembly. That said once you factor in the price of other components that need replacement and tool rentals or shop time the total cost tends to equal out. 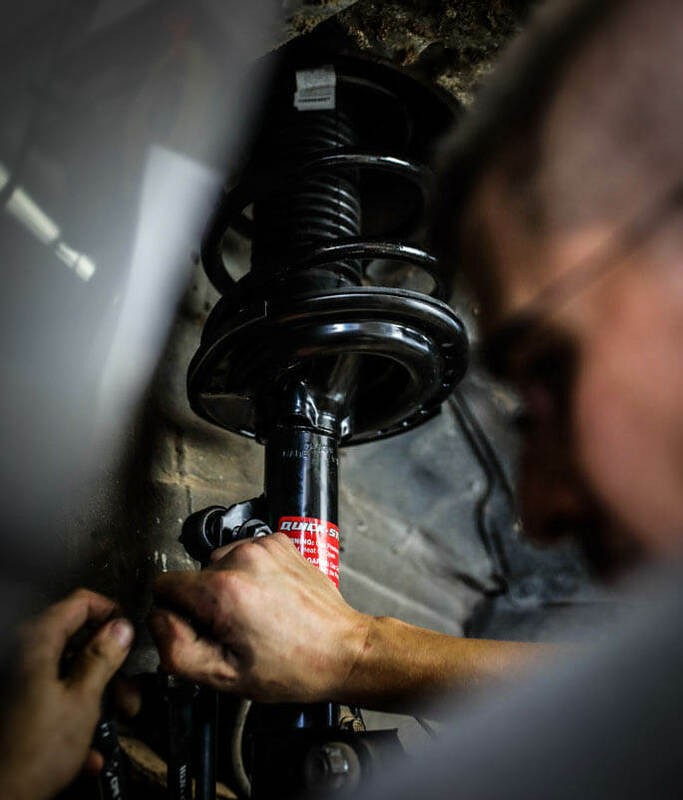 Once you buy a complete strut assembly the only thing you have to worry about spending is the few hours it will take to install on your vehicle and the alignment that you should get after any suspension work. An important factor to think about when replacing a strut is spring diameter. To achieve a similar-to-factory ride from your replacement you want a spring very close to the original dimensions, which means reusing the original spring or finding a very similar replacement. One of the Garage Gurus at Moog recently explained that a particular year, make, and model could have as many as 15 spring diameter variations based on engine size, trim package, and other factors. Aftermarket parts manufacturers offer the most common applications though some of the cheaper manufacturers will consolidate spring diameters to expand coverage and save money, but this can leave you with different ride height and possibly a stiffer ride. Comparing the spring diameter of the original to the new spring will give you an idea of what kind of ride to expect. Full Disclosure: Suspension.com sells Moog strut assemblies and Pedders struts so we endorse their products, but we also believe them to be a solid option for our customers (or we wouldn’t sell them). With that out of the way we urge caution when looking at bargain basement strut assemblies. You very much get what you pay for when it comes to struts and strut assemblies, and while a knock-off brand may sell two struts for the price of one you can guess that the price will reflect the quality difference. If you want restoration, go with an established brand. If you want to gamble on a short term solution you can take a chance with the knock-offs. If you can find a complete strut assembly from a good brand for your vehicle then they can be an easy DIY solution that refreshes your struts with all new components. This a great option for vehicles that have seen a lot of miles or rough usage and possibly need each part of the strut replaced anyway. Replacing just the strut requires more work and specialty tools as a DIY project, but if the original coil spring isn’t sagging then it can restore handling and ride characteristics to like new settings, though some other components may require replacement at the same time or in the near future. It can be a cheaper fix that will likely restore handling very close to factory settings. Moog Strut Assemblies are a great option for replacing a worn strut plus all of its components. These bolt-on assemblies include several features that ensure smooth operation such as a spring top plate tested to 1 million heavy-duty cycles, triple sealed piston, and precision valving all covered by a 3-year warranty through DST. Whatever method you choose be sure to get an alignment done after installation.